Candidates’ maximum age should be 35 years. Age Relaxation is applicable for SC/ ST/ OBC/ Ex- Serviceman candidates as per Govt. rules. 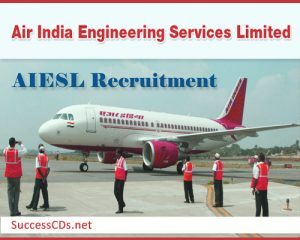 Candidates should have to pay of Rs.1500/- drawn by Demand Draft in favour of “Air India Engineering Services Ltd.” payable at Delhi. No fees to be paid by Ex-Servicemen/ Applicants belonging to Reserved categories.